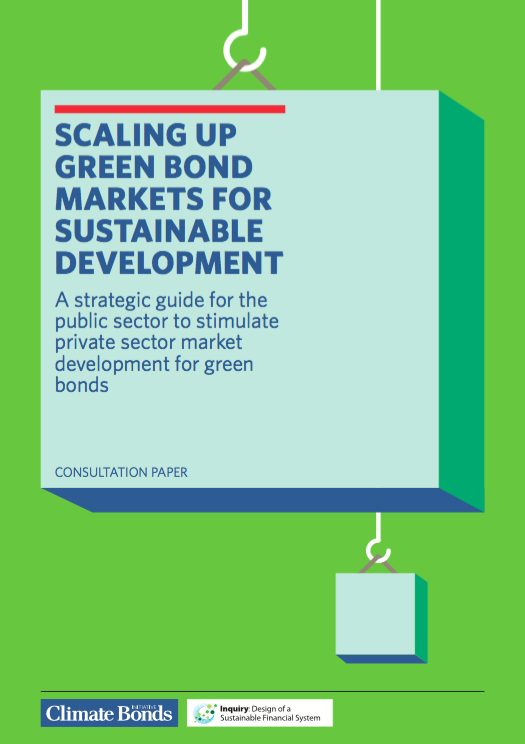 This Public Sector Guide is the result of a partnership between the Climate Bonds Initiative and the UNEP Inquiry into the Design of a Sustainable Financial System. The Guide includes an annex from the World Bank Group as an additional resource for policymakers in emerging economies to assist them in foundational bond market development. Download the full guide here A4 version / A3 version. Download the Executive Briefing here. The green bond market - bonds whose proceeds are used for green projects, most commonly climate mitigation and adaptation projects - is growing rapidly, with outstanding issuance at US$66bn in June 2015. This growth needs to be accelerated to keep pace with the climate challenge. According to the Global Commission on the Economy and Climate US$6.2 trillion of investment is needed annually for new low-carbon infrastructure, which countries must start building now if they are to limit the effects of climate change. Bonds can provide the long-term, stable investment returns which institutional investors need, making them appropriate vehicles to tap into institutional investors’ large capital holdings at scale. Bonds are also an attractive financing tool for infrastructure projects, providing a potentially low cost and long-term source of capital. With appropriate policy settings and support it is estimated that $1trillion in annual green bonds issuance could be reached by 2020.